We always keep halloumi in the fridge since it has a long shelf life and it’s so useful if you find yourself in a cheese-based emergency. It wasn’t exactly an emergency this evening but we had planned to go out and changed our minds at the last minute. There wasn’t much else around the kitchen would could be turned into a meal so out came the halloumi. I had planned to chop the avocado into the lentils but forgot so hastily threw it on the top just before Stephen took the picture. 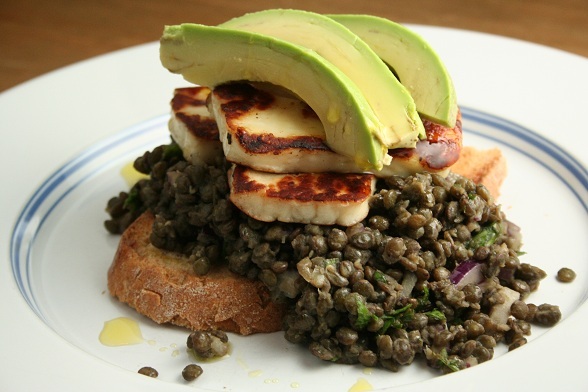 We ended up mashing it onto the toast and then piling the lentils and halloumi on top and it was brilliant. In fact, I think it’s one of the best things I’ve eaten for a while and considering it was made up of store-cupboard ingredients and took very little time to put together pleases me even more. No need for a recipe, just cook the puy lentils and then dress with some salt and pepper, red onion, olive oil, lemon juice and herbs. Fry the halloumi and serve on avocado toast. Subscribe to comments with RSS	or TrackBack to 'Halloumi with Lentils and Avocado'. Absolutely yummy! Kerri this looks mouth watering, def puts my last minute, lack of ingredients dishes to shame. .-= Domestic Goddess´s last blog ..Enter The Typical Male =-. Thank you, DG. Halloumi is a brilliant thing to have on hand in emergencies! I think this will become a regular dish now, rather than one that’s just thrown together at the last minute in desperation. No-one should ever find themselves with a cheese-based emergency. Good work.